Serena Fernandes started Minas da TI to teach other women about IT. In the process, she discovered that a lot of IT companies ask for skills that are not taught at universities. 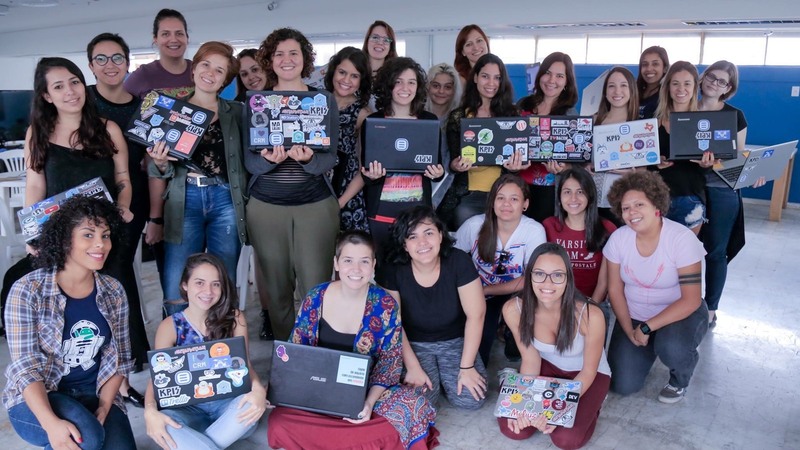 She decided to include those topics in her meetups, which has already led to some successful job placements of Minas da TI community members. Serena, tell us a bit more about your community and why you started it. I wanted to do something to empower women to get excited about IT and also consider becoming developers as a career choice. I was testing the idea of an all-woman community in my network and got mostly positive feedback. I even consulted a professional psychologist (laugh). He confirmed that when women get together in a group around a certain subject, it helps them build confidence. Two other organizers and I started to build the community in 2016, and after 1.5 years we now have 350 members. What is your personal motivation behind the community work you do? The longer I'm doing this, the more aware I am of the many problems – that can turn into opportunities – in the IT industry. I see women giving up on IT claiming that the industry is, “not for women,” and I want to show them that there is another way. I believe in leading by example. If I can convince one girl at the time and she passes this experience on, soon a bigger group can be influenced. Creating a community around this helps a lot. I'm really happy about the inclusive atmosphere in Minas da TI. This was my original intention – to create a community of women interested in tech, no matter their background or professional experience. So seeing that actually happen means the world to me. We have women coming to meetups that aren't even from the IT industry. They come and sometimes get so excited that they think of a career change. Diversity also enables very interesting conversations to happen as women outside of IT can give another perspective on many topics. Does having such a diverse group create any interesting challenges? I think my biggest challenge is to make sure that every girl that comes to a meetup feels included even if she is too junior to participate in some of the more advanced topics. In our first dojo we only had 2 women participating and 20 others watching. But for the next dojo, they were already more confident and more of them got actively involved. How do you decide about the content of your meetups? I try to include a lot of content that isn't taught in colleges but is asked for by IT companies. I usually source the topics for the next meetup from the women directly, and then look for a speaker that can deliver on that. How are you dealing with the community growth and attracting new members? What works for Minas da TI is that it offers a very friendly and inclusive environment. If you make new friends, you want to keep meeting them and also introduce them to your circle of friends. Time for networking is a big part of our meetups and that's how we usually start. Talking over drinks and snacks and making connections. I'm really good at convincing people (laugh). Even if I'm not 100% sure, I come across as confident (laugh). I think the women also appreciate that I'm approachable. They can call me and discuss anything they want. dealing with. What tools are you using to help you? Right now we manage with having a Facebook page and a mailing list. But this is not sustainable as we grow, so I'm looking at other options like having a Slack channel. I'm trying to explore how we can work with companies more. We appreciate all the support from them like free venues, snacks, and drinks. Some companies we work with have already hired women from Minas da TI. I'm getting a lot of CVs from women looking for jobs or wanting to change jobs. I'm trying to find a way to establish a relationship with HR departments of companies and help place them. I have this idea for an event. We would coach the women to do an elevator pitch about their skills and invite HR Managers and CEOs of companies to see the presentations and decide if they want to offer them a job. As for the more distant future, I'd like to see Minas da TI spread to more cities besides Belo Horizonte and Sao Paulo. As I'm giving presentations and travel, I have this topic in mind and look for like-minded people that would be interested in starting a community.